After a long night of inventory, I went back to the hotel room and caught some much needed ZZZ’s before a long day ahead. Annie and I tend to come up with an idea of places we would like to visit before going on one of our adventures, but we never destroy our sense of adventure with an unnecessary itinerary. The plan today was to eventually make it to Monument Valley and who knew what else along the way. As you’re leaving Farmington, New Mexico, it’s hard to miss Shiprock’s pinnacle piercing it’s way towards the sky. I had been to Shiprock the previous year during that whirlwind trip I talked about last week. It is quite the spectacle and a sight to behold. You are made to feel quite small standing at it’s base, craning your neck to see the top. It’s hard to fathom the immense enormity of Shiprock, even whilst standing in it’s shadow. Needless to say, we were making the side-trip to see it. I wanted Annie to share in my amazement of this natural wonder, so we took a couple of hours out of the day to make the offroad journey to it’s base. Annie and I explored Shiprock for about an hour before returning back to the road and our destination for the day, Monument Valley. As we were headed towards Monument Valley we decided to make yet another side-trip to a well known location, The Four Corners. This particular spot is popular because it’s the only place in the United States where four states all meet at exactly one point. I wouldn’t say this was a highlight of the trip, but Annie and I did get to spend some time talking with some of the Navajo from the area who were selling their crafts. They were very interesting people to speak with and we even ended up purchasing a few trinkets to commemorate the trip. One of the men made arrows out of Obsidian which was very fascinating to me and Annie ended up purchasing a traditionally made vase with very intricate etchings and ink work which we have used to decorate a shelf in our home. The high point of the day was, of course, driving into Monument Valley. You can easily do a google search and see incredibly iconic photographs of this amazing valley, but being there standing in the shadows of the monuments yourself is an awe inspiring experience that you have to do at least once in your lifetime. It is truly incredible. Annie and I spent at least 6 hours here taking in all the scenery. We made the long drive around the Rain God Mesa, stopped at Artist’s Point, and finally ended the day at John Wayne/Ford’s Point and shot the earth’s shadow moving into the sky after sunset. As we were waiting on sunset a beautiful team of wild mustangs grazing the valley wondered up to us. They came within 20ft of me and I captured a few photos of them. They were such rugged and beautiful animals. 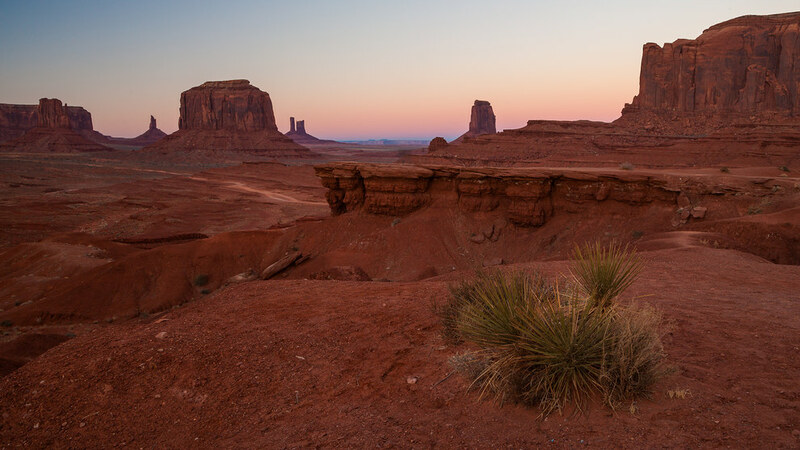 After photographing the crepuscular sky over Monument Valley, we went and enjoyed a traditional Navajo meal at the View Restaurant. Which, by the way, has an amazing view of Monument Valley! The night sky there is incredible, and I wish we had all the time in the world to spend there to photograph the area. Alas, we were on a mission to see Zion National Park, and on the way, made a pit stop in Paige, Arizona to get some much needed sleep after a long day of exploration of the Wild Wild West.